When vaudeville impresario Martin Beck "discovered" a struggling Harry Houdini in 1899, it was Houdini's ability to escape from handcuffs which caught his attention. Although Houdini was hardly the first or only performer to do handcuff escapes, he would take the act to a new level over the next several years, and it was as the "Handcuff King" that he gained his first measure of fame. There was no one "secret" to Houdini's ability to escape from handcuffs, but a combination of technical knowledge, physical skill, and trickery. It all started with what one locksmith who knew him called his "remarkable knowledge of locks and locking devices." Houdini collected and studied locks all of his life and claimed that he had "photographic eyes" that helped him remember how each type worked and could be opened. 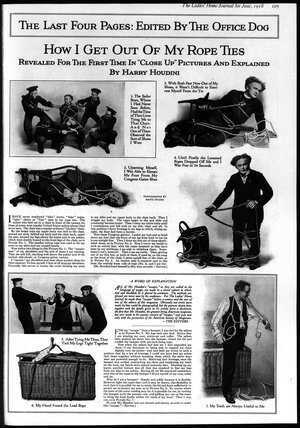 Most of the time Houdini used a key hidden in or smuggled into the cabinet or jail cell, either on his person or by an assistant. Depending on how he was bound, Houdini would manipulate the keys with his hands -- sometimes using specially designed extension rods -- or with his teeth. But he also knew tricks for opening many of the simpler types of cuff without keys. In "Handcuff Secrets," a book he published in 1910 to discourage the legion of imitators trying to ride his coattails, Houdini wrote that "you can open the majority of the old-time cuffs with a shoestring. By simply making a loop in the string, you can lasso the end of the screw in the lock and yank the bolt back, and so open the cuff in as clean a manner as if opened with the original key." And as he demonstrated in his own defense during the slander trial in Germany in 1902, some cuffs could be opened simply by banging them against a hard surface, which might include a lead plate fastened at the knee under his trousers. Houdini also used tricks that didn't involve opening locks. If presented with a particularly difficult lock, he might insist it be placed higher on his forearm, then simply slip these cuffs over his wrists once the easier cuffs placed there had been removed. And he was not above using trick cuffs, designed to pass inspection but easily opened by means of a fake rivet. But as he reminded us in "Handcuff Secrets," the unique magic of his escape act lay in its presentation: "You will notice that some of these tricks are very simple -- but remember it is not the trick that is to be considered, but the style and manner in which it is presented." I offer $100,000 to any human being living that can escape from all the cuffs I carry, and from which I release myself. I escape from the celebrated Bean Giant Cuff with them locked behind my back, a feat no one else has ever accomplished. My hands can be fastened back or front. It makes no difference how many pair of cuffs are locked on me (at the same time), and I will allow the keyholes to be stamped and sealed, and as I bring out all the cuffs interlocked, it proves conclusively that I do not slip my hands. I have escaped out of more handcuffs, manacles, and leg shackles than any other human being living. As I carry a very rare, curious and costly collection of torture, antique and modern Handcuffs (of every style and make), I give a scientific and historic lecture on them; in fact, I have the only complete act of this description in existence. Houdini, always the student, learned everything there was to know about ropes and various methods of tying them. But to a much greater degree than with handcuff escapes, he relied on brute physical strength and endurance to set himself apart from the average escape artist. The whole secret lies in the fact that it is quite impossible to tie a man while in a standing position, with such a length of rope, so that he cannot squirm out of it with comparative ease, if the tying BEGINS AT ONE END OF THE ROPE and finishes at the other . . . It is the experience of all who have used this tie, that the first few knots are carefully tied, but after a time it will be found that the rope is being used up very slowly, and they will begin winding it around the body and making very few knots . . . If the committee . . . begin to make more knots than suits you, it will be well to swell the muscles, expand the chest, slightly hunch the shoulders, and hold the arm a little away from the sides. After a little practice you will find that such artifices will enable you to balk the most knowing ones. You should always wear a coat when submitting to this tie, as that will be found to be an added help in obtaining slack . . .
Houdini's famously powerful physique, flexibility, and general athleticism made him one of the most adept performers in history when it came to rope escapes. His mental and physical toughness came into play as well, since he seemed to believe escaping from a rope tie was merely a matter of time, and he refused to ever give up. But he wasn't opposed to a little trickery, either: "A sharp knife with a hook-shaped blade should be concealed somewhere on the person, as it may be found useful in case some of the first, carefully tied knots prove troublesome. A short piece cut from the end of the rope will never be missed." By his own account, Houdini first thought of introducing the straightjacket into his act while touring an insane asylum in Canada. Peering into a padded cell, he saw a "maniac" struggling against the device, "rolling about and straining each and every muscle in a vain attempt to . . . free himself from his canvas restraint." Houdini began experimenting the next day, and soon the straightjacket, with all its sadistic fascination, had entered into his repertoire. The first step necessary to free yourself is to place the elbow, which has the continuous hand under the opposite elbow, on some solid foundation and by sheer strength exert sufficient force at this elbow so as to force it gradually up towards the head, and by further persistent straining you can eventually force the head under the lower arm, which results in bringing both of the encased arms in front of the body. Once having freed your arms to such an extent as to get them in front of your body, you can now undo the buckles of the straps of the cuffs with your teeth, after which you open the buckles at the back with your hands, which are still encased in the cavas sleeves, and then you remove the straitjacket from your body. The dry, technical nature of this description belies what the escape actually looked like. As old film clips show, Houdini looks like a madman writhing and jerking about; it looks painful and one gets tired just watching it. Doubtless this was part of the fascination. 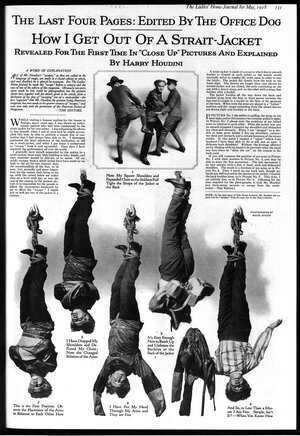 Houdini often turned his straightjacket routine into a public spectacle by performing it upside down, suspended from one of the towering new skyscrapers which had begun to dominate city skylines. While requiring more strength to undo the buckles, this actually made it easier to get his arms over his head, the key to the escape. With more difficult straightjackets, Houdini would perform shielded from view. If using a jacket he supplied, this enabled him to used specially designed devices built into the jacket; if the jacket was supplied by someone else, he was sure to have a concealed or hidden tool to cut the laces or help himself some other way. In performance Houdini poked and pounded the can to demonstrate its solidity. When he walked offstage a moment, stagehands filled it to overflowing with twenty or so pails of water. Returning in a bathing suit, he first invited the audience to experience what long submersion might be like. He asked them to time themselves while holding their breath. Then he squeezed himself into the can, the displaced water splashing onto the stage. Long before a minute elapsed, most spectators gave up, gasping. 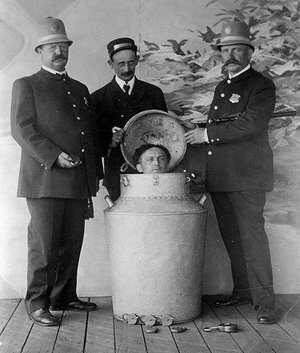 Houdini, however, stepped out of the can, smiling, to perform the actual test. Kukol [his assistant] appeared onstage with an ax. Houdini explained that if something went wrong, Franz would after a certain time smash the milk can open. Now handcuffed, he again folded himself inside. This time the steel cover was slammed on, the hasps latched, the cover padlocked. The ghost house was pulled forward to surround the can. The audience waited nervously, watches in hand, Kukol standing ready to hack. After little more than two minutes Houdini walked from the cabinet, dripping, puffing, blowing, breathless. The ghost house was withdrawn, revealing the milk can with its six padlocks still closed and in place. It is understood, of course, that the milk can will bear a close examination. Its simple construction and the fact that it is made entirely of metal make it appear very secure and free from trickery. The simple method of escape depends on the fact that the collar of the tapering portion is not riveted to the top of the large cylindrical portion of the can. The rivets are there, but they are shams. Inside the milk can, the performer can separate the two portions at the joint. This is very practical, and despite its simplicity, it cannot be detected. The secret is safe because the collar fits tightly to the cylinder. It cannot be pulled from its position; no one can obtain a good hold on it. The sides of the collar are slippery (they may even be slightly greased), and there is no possibility of any one's budging it. But from within the can, the performer is in an ideal position to work. With ordinary effort he can break the neck away from the cylinder and thus escape. The stronger the performer, the easier the escape. By removing the loose section and sliding it out of the way, all difficulties are overcome; and after the escape it is necessary merely to replace the loose portion and make sure that it is firmly in position so that it will again stand inspection. While the Milk Can may sound easy, and certainly was simpler than most of his other escapes, folding oneself into such a tiny space while under water required nerves and stamina few possessed. But above all, as advertisements for the act attest -- "FAILURE MEANS A DROWNING DEATH" -- the Milk Can demonstrates Houdini as master showman. 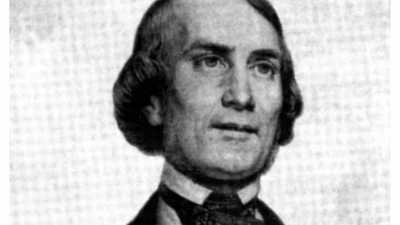 The name "Harry Houdini" pays homage to Jean Eugene Robert-Houdin, the French performer widely considered the father of modern magic. But Houdini’s relationship with his famous predecessor was not as simple as their shared name suggests. In 1899, Harry Houdini was ready to retire as an entertainer. Acrobat, illusionist, hypnotist, and puppeteer -- Houdini had tried all of these and more, and nothing had worked. Then he met Martin Beck. Sir Arthur Conan Doyle is universally associated with Sherlock Holmes. 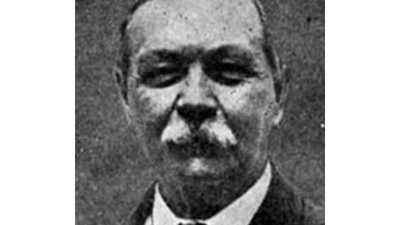 People are surprised, then, to find out that the real Conan Doyle had a fervent belief in Spiritualism that dominated the final dozen years of his life.